The following essay was first published as a preview for the exhibition Carved out of Life curated by Clinton Nain and held at at Craft Victoria from 18 June till 24 July 2010. The essay was published in Art Guide Australia, July/August 2010. Installation image of carved Emu eggs by Lucy Williams. With the rise of post-colonial theory, this kind of claim has been a common refrain in Indigenous art criticism. Colonial modes of art production are reclaimed as acts of artistic subterfuge through which forbidden pre-colonial knowledge is preserved beneath the cover of western aesthetics. The problem with this kind of revisionism is that it creates a static and uniform criterion of value, in which Indigenous artworks can only be ‘significant’ or ‘important’ insomuch as they contain some hidden cultural cache; some link to the past; some authentic ‘Aboriginality.’ This is not to suggest that carved emu eggs might not be rich in such ‘traditional’ cultural content, but rather, that such an emphasis obscures a more complex cultural history that might offer a greater insight into this enigmatic medium. Carved emu egg by Jonaski Takuma, 1895 – 1905, Powerhouse Museum, Sydney. The practice of carving emu eggs arose in the mid-19th Century. It was not originally considered an Aboriginal medium, in fact, one of the most successful early carvers was a Japanese craftsman named Jonaski Takuma who set up shop in Sydney’s Strand Arcade in 1893. 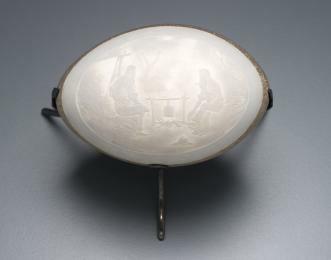 The aesthetic of the first carved emu eggs belonged firmly to the ornate decorative style of the late Victorian era. Their content, on the other hand, was resolutely nationalist, reflecting the idealised bush ethos pioneered by The Bulletin, Henry Lawson and the Heidelberg painters. In the post-War years, this aesthetic and ideology was superseded by a more modernist vision of Australian design and identity. Coupled with new government restrictions on the harvesting of emu eggs, the practice of carving emu eggs became increasingly rare amongst non-Indigenous artisans. It was around this same time that the carving of emu eggs began its remarkable ascendancy amongst Indigenous communities. This coincidence is illuminating, for just as non-Indigenous Australians were dismantling the vision of bush nationalism embodied in carved emu eggs, it was appropriated by Indigenous artists for an entirely different ideological purpose. Like the Hermannsburg School of watercolour painting, emu egg carving was an introduced medium that demonstrated skill, craftsmanship and expertise, while its content professed a uniquely Aboriginal affinity with the landscape. The medium itself neatly balanced a dichotomy of assimilation and self-assertion: carved onto an objet whose acquisition required the knowledge of the hunter-gatherer, it suggested an inherent physical link to Indigenous heritage, while the realist images etched upon it implied a reconciliation with western aesthetic values. 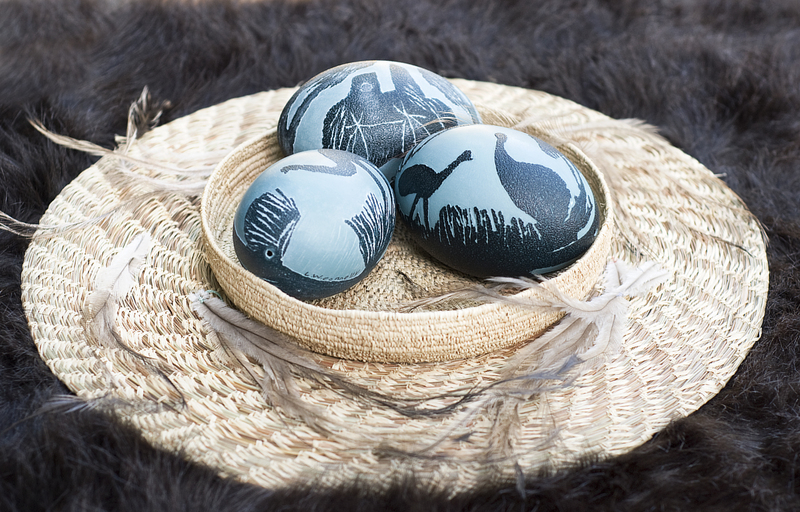 Prior to the 1970s, there was little discernible difference in either content or style, between carved emu eggs produced by Indigenous and non-Indigenous artists. In some instances, artists of both cultures worked side by side. However, as issues such as land rights and Indigenous self-determination began to gain momentum, many Indigenous artists began to seek a more assertive vision of Indigenous identity. Carvers like Bluey Roberts, Badger Bates and Adrian ‘Ringo’ Morten began to replace realist imagery with an array of neo-traditional Aboriginal designs, drawing upon elements of rock art, desert painting and the traditional markings of their southern Indigenous tribes. Others, like Esther Kirby or Western Australian artist Barry Belotti, retained the realism of their predecessors, but used it to critique colonial incursion. Writhing from the surface, Kirby’s depictions of Indigenous faces wear a mask of suffocating anguish, as though silenced by the confines of an imposed visual language. 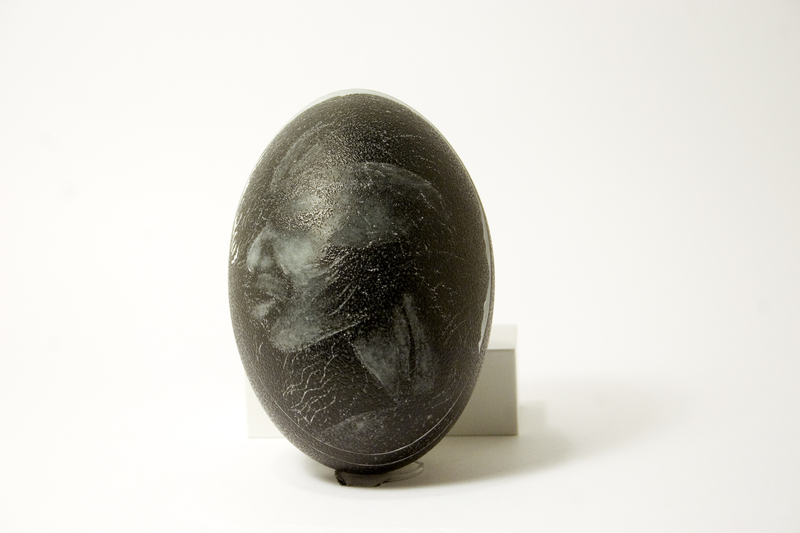 Esther Kirby, Carved Emu Egg, 2010. Clinton Nain is absolutely correct in arguing that carved emu eggs deserve greater critical attention. For the past century, southern Indigenous people have been exploring the medium, changing its style and content to reflect their changing historical, social and political situation. Critically evaluating these developments offers a unique opportunity to explore the complex cultural history of southern Indigenous people, their continued negotiation with modernity, and the historical forces that have constructed contemporary Indigenous identity. They reveal how seemingly fixed notions of identity, place or culture are remodelled, reappropriated and reused for changing political, ideological or personal reasons. It is precisely these indicators that show how artists negotiate the forces of history and shed light upon the world in which we live. Just as Indigenous and non-Indigenous craftsmen once worked side by side, perhaps in these tiny globes we might see a vision of the world that we share, as much as the differences that we inscribe upon it. [i] Brenda Croft, ‘The Gift of Seeing with Fingers’, Tactility: Two Centuries of Indigenous Objects, Textiles and Fibre, exhib. cat., National Gallery of Australia, 2003.